To continue in our Chrysalis road race adventures, five students and two staff trained and completed the Freezer Burn in Missoula the first weekend of December. The group drove to Missoula the evening before, enjoying dinner out and a brief tour of the town and university. We woke up the next morning pleasantly surprised to fine a fresh layer of snow on the ground. After all, this wasn’t called Freezer Burn for nothing. December in Montana? You never know what you may get – rain, snow, sleet, hail or sunshine. The race was 10 miles long with a mountain view the whole time. 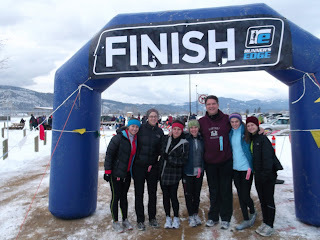 The girls did an excellent job, each completing the entire course. After the race we enjoyed hot cider, coffee and other treats by the warmth of a huge bonfire. I think it’s safe to say that a good time was had by all and we hope to participate again next year!